Uncertainty in Games is an attempt to delve deeply into one important aspect of games: the fact that they must foster uncertainty to hold the players' interest. 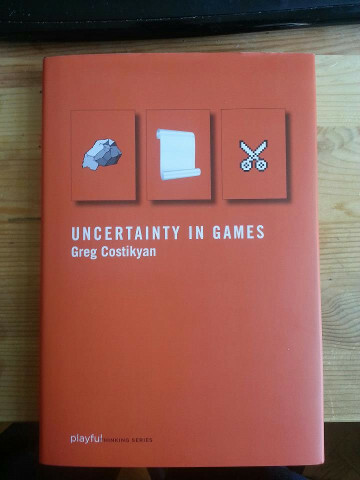 It addresses the role uncertainty plays in games; analyzes a number of diverse games to tweeze out what sorts of uncertainty they provide, discusses the role and utility of these different forms of uncertainty, and suggests some ways that designers may improve and inform their designs through an understanding of uncertainty. Uncertainty is not, in most circumstances, a good thing. We do not wish to be uncertain about whether we can pay our bills, uncertain of the affections of the people who matter to us, uncertain about our health, or uncertain about our job prospects. Businesses are always concerned about the management of risk; they seek ways to reduce uncertainty. At least in the developed world, people pay taxes mainly as a means of reducing uncertainty—the risk of invasion and conquest, the uncertainty of terrorism, the risks created by possible unemployment, by loss of income in old age, and by health crises. They top this off by devoting a portion of their income to insurance, pension plans, and savings, all attempts to reduce uncertainty in their lives. Yet if the goal is a reduction in uncertainty, the reality is that we live in an uncertain and conditional universe. Even in apparently civilized countries, madmen may come to power and slaughter millions of their own citizens. Apparently sane leaders maintain arsenals capable of destroying whole cities at a blow. Despite the miracles of modern medicine, terrifying diseases can spring out of nowhere and devastate whole populations. Seemingly harmless practices—smoking, applying pesticides, drilling for undersea oil—can turn out to have devastating and unexpected consequences. We may wind up cooking ourselves in our own industrial waste, or turning the oceans into sewers. For that matter, terrorists could get hold of a nuke, an asteroid impact could erase tetrapodal life from the planet, a nearby star could go supernova and subject us all to killing radiation, nanotechnology could turn us all into gray goo, and Jesus could return, smiting all sinners—and I can assure you that, by the standards of the people who think this last remotely possible, I certainly qualify as a sinner. The world is in fact filled with terrifying uncertainty, and it is a tribute to the dauntless and objectively insane optimism of the human species that we, most of the time, are fairly cheerful about it. But the reality is that we are faced with uncertainty throughout our lives—and that much of our effort is devoted to managing and ameliorating that uncertainty. Is it any wonder, then, that we have taken this aspect of our lives, and transformed it culturally, made a series of elaborate constructs that subject us to uncertainty—but in a fictive and nonthreatening way? I'm talking about games, of course. Even as the digital revolution has progressed apace, tabletop games -- board and card, roleplaying and miniatures -- have grown and attracted many new fans. Indeed, in tabletop gaming there is far more diversity and design innovation than in digital games, and tabletop games have become of increasing interest to videogame designers, game design instructors, and people who study games of all forms. In this volume, people of diverse backgrounds -- tabletop game designers, digital game designers, and game studies academics -- talk about tabletop games, game culture, and the intersection of games with learning, theater, and other forms. Some have chosen to write about their design process, others about games they admire, others about the culture of tabletop games and their fans. The results are various and individual, but all cast some light on what is a multivarious and fascinating set of game styles. Tabletop: Analog Game Design at the ETC Press site. Copyright © 2013 by Greg Costikyan.